Dialogue, he said, takes place when each party to the conversation is willing to be affected by the other. In the second statement, when I lean in and listen beneath the hopelessness, frustration and fear of ” they just don’t want the same things that we want,” I hear a deep yearning for connection and shared vision. And this yearning is exactly the beginning of connection. In our Nonviolent Communication trainings, we learn how to listen to our own heart’s yearnings, and bring our words closer to conveying them, rather than getting stuck in the gauntlet of impossibility and separation created by our minds. And we learn to hear the yearnings in the heart of the other person. For me, so much of Nonviolent Communication is about learning how to take care of myself enough so that I have the capacity to be affected by what the other person says; so that I feel moved when I hear what is important to the other person. I have noticed that I am much more likely to be open to what the other person has to say when I feel spacious, relaxed and confident that I won’t let go of what’s important to me. In a way this sounds counterintuitive– the more sure I am of what’s important to me, the more I can open to hearing the other person? Yes! When I have clarity about what’s important to me, when I accept and even embrace what’s important to me, I feel settled and empowered in myself. I’m not looking for “validation” from the other person. I’m no longer threatened to hear them, to hear their pain and humanity in how they are expressing themselves. Connection is possible. In this moment of clarity and empowerment, I can take responsibility for how I am likely to be heard. It’s much more likely that my words will support my humanity being seen and heard if I am holding the other person’s humanity with care. This is what we mean by nonviolence. We are going for connection rather than being right or winning. In situations of perceived power imbalance, we might call this the capacity to speak truth to power. What will support us really being heard? By creating a connection that is alive between me and the other person so that they can hear what’s important to my human heart and so that I can hear what is important to their human heart. It doesn’t mean agreeing or disagreeing or giving in or giving up. It means that I am standing in such an empowered place, in clarity about what’s important to me, that I can dare to step forward to create connection with people with whom I have vast differences. So let’s begin talking to each other! 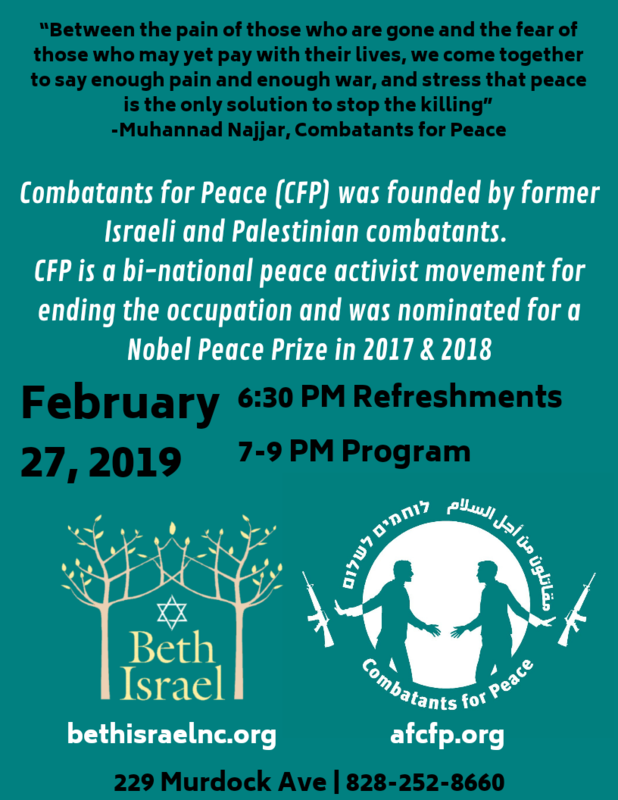 And, here in Asheville we have an opportunity to witness two “sides” talking to each other- a delegation from Combatants for Peace, an organization of former Israeli and Palestinian combatants, will be speaking publicly on February 27. Here are the details, and please send me an email if you would like to support this event in any way!